The title tag and meta description are the visible elements of every website in the SERPs. Find out in this article how to optimize your meta descriptions. For a long time, the snippet text in the Google SERPs was limited to only two lines. However, Google has now confirmed that it has extended the length of the snippet, giving you much more potential to optimize your meta description to draw attention to your website and increase the CTR. In this article, we are providing you with practical advice for optimizing your meta descriptions. If you did a survey among SEOs and asked them what their favourite daily activity was, they probably wouldn’t say meta descriptions. However, a lot has been happening in the SERPs in recent years. Google has greatly increased the display for snippets, and is now experimenting with longer titles and descriptions in the search results. A speaker from Google officially confirmed via searchengineland.com that Google has increased the length of the snippets in the SERPs. The main reason behind this change is that Google wants to provide users with more helpful and descriptive snippets, so that they will be able to decide more easily whether a search result is relevant for them or not. The following example demonstrates some of the changes that Google has been making. Instead, Google uses the first paragraph of the article as the displayed snippet. Compared to the meta description in the source code, the text that Google shows in the snippet more effectively depicts the content of the article, and therefore gives the user more valuable information about the content of this particular search result. 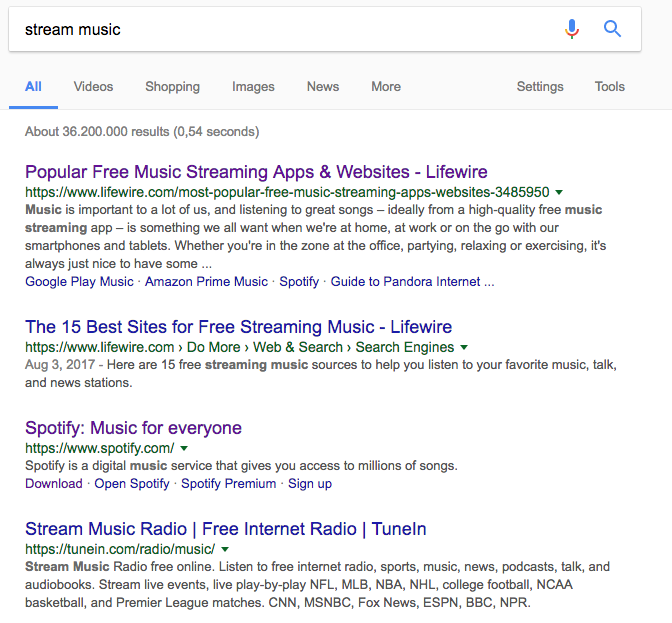 For the third example from Spotify, Google uses the meta description from the source code – clearly, Google sees this as a sufficient description of the content – it is enough for the user to be able to tell whether the content of this website is relevant for them. In many CMS systems, such as WordPress, the meta description contained in the source code will often automatically build the first paragraph of the article. Even here there is no guarantee that Google will use this – they might still use an alternative paragraph depending on what Google thinks will best suit the user’s intentions. Why Is it Important to Optimize Your Meta Descriptions? Every meta-description has the potential to become one of the first elements of your website that a user sees when searching the web. A meta description that accurately represents your web content and contains a call to action, showing the user that your webpage offers added value, can stimulate a user to choose your snippet, and click on the link to your page. A good meta description can also strengthen brand identity and build up trust in your domain. The meta description can therefore make it possible to differentiate yourself from your competitors, independent of your website’s ranking in the SERPs. What Makes a Good Meta Description? Summarize the content or topic of the target page in one sentence and end with a call-to-action. Add information about payment options or delivery times for online shops. Use at least one USP in the description, e. g. price, quality or selection. The above examples of current snippets in the SERPs show that Google does not always use the existing description. The better the description matches the intention of the user, the more likely it is that Google will use it. Instead of always using the snippet contained in the source code, Google will now firstly search through the text to find appropriate content, for example articles with short introductions. You might even think that the snippet is now superfluous, as Google will collect the necessary text for the snippet anyway. If you have content on your site such as articles with short teasers that correspond to the function of a description, Google may use this as description text for the snippet. Google has even officially said that they firstly look through the website content for suitable context for the meta description, and then use the meta description as an alternative. However, it’s still worth ensuring that your meta description is fully optimized, in case that Google does use it for the snippet text. Only use the main keyword of the landing page once: descriptions full of keywords are not only rated as spam by search engines, but are also unhelpful for users, as they are less likely to accurately represent the content of the webpage. Use the exclamation point sparingly: your meta description should encourage users to click, but exclamation marks and imperatives make clicking seem more like a compulsion than an invitation. With the extended snippets, Google is increasing the importance of the description text in the SERPs – this makes optimization of your snippets even more important. After all, it’s all about convincing users to click on the link to your landing page rather than that of your competitor. The extended snippet also gives you more control over the CTR. The Ryte software provides you with various tools to analyze and optimize your meta descriptions, as well as to monitor the impact on the click-through rate. Find out in this article how the Ryte software can help you to optimize your meta descriptions. Published on 12/20/2017 by Olivia Willson. Olivia left her home town, Cheltenham, to start her degree in German and Music at King’s College London in 2011. She moved to Munich after finishing her degree and has been part of the Marketing Team at Ryte since July 2017, where she is mainly responsible for the English Ryte Magazine and English Wiki.